The Navy Gets Its First Female SEAL Candidate : The Two-Way Along with the SEAL officer candidate, another woman is up for an elite job as a special boat operator, some 18 months after the Pentagon opened front-line combat jobs to women. Basic Underwater Demolition/SEAL students in training in 2014. The Navy now has two female candidates to join the elite special operations forces for the first time since front-line combat jobs were opened to women. The Navy says it has its first female candidates for two elite special operations jobs previously closed to women — including a prospective SEAL. One woman is in the pipeline to be a SEAL officer, and another is on the path to becoming a special warfare combatant crewman. The news was first reported by Military.com, an independent website. The Navy declined to identify the candidates, citing security considerations. The announcement comes more than 18 months after the Pentagon declared that women can now serve in front-line combat positions. "They are the first candidates that have made it this far in the process," Lt. Cmdr. Mark Walton, spokesman for the Naval Special Warfare Command, told the Two-Way. Whoever these unnamed trailblazers are, the path ahead for them won't be easy. To become a SEAL or SWCC, they'll need to make it through Basic Underwater Demolition/SEAL training, or BUD/S, which is designed to be extremely physically and mentally demanding. 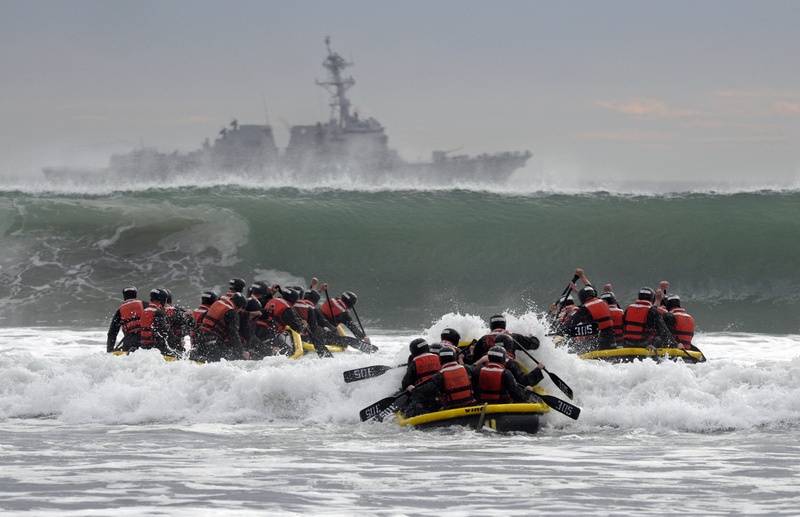 Few candidates who undertake the training emerge as SEALs or special boat operators. The enlisted SEAL attrition rate is 73 to 75 percent, according to the Navy, while the SWCC attrition rate is 63 percent. The SEAL officer program has a higher rate of success: 65 percent of candidates make it through. The officer program isn't easier, though — the Navy attributes the differing success rates to a larger number of candidates in the enlisted program. Female candidates for these jobs will have to complete the same training that men do, without any allowances for differing average physical capabilities. What makes the training so difficult? "It's different for everyone," Walton said. "It could be the physical stuff, it could be mental, it could be medical. There could be a lot of different reasons." While the two candidates are now closer to these elite Navy positions than a woman has ever been, it may be a while before one of them finally gets the job. "It would be premature to speculate as to when we will see the first woman SEAL or SWCC graduate," Walton told NPR. "It may take months and potentially years." Female candidates aren't the only change to come to the Navy's elite operations. Walton confirmed that SWCC now includes one transgender person. And if the two women in the Navy's special operations pipeline are successful, we may not get much detail. "If you announce who they are, that removes the point of them becoming a special operator," said Walton. "I guess we'll see what we do ... when we get there."